Last weekend I've been at SFBay ACM Data Mining Camp and did an introduction session to Decision Trees, Stochastic Gradient Boosting and Random Forests. For people who are interested in further reading about this topic, I'm posting some links in this post. Decision trees idea is to build a set of rules in hierarchical form, that will allow to predict the value of a target variable. Rules are usually in form of "if-then-else" statements and organized in the form of a binary tree. 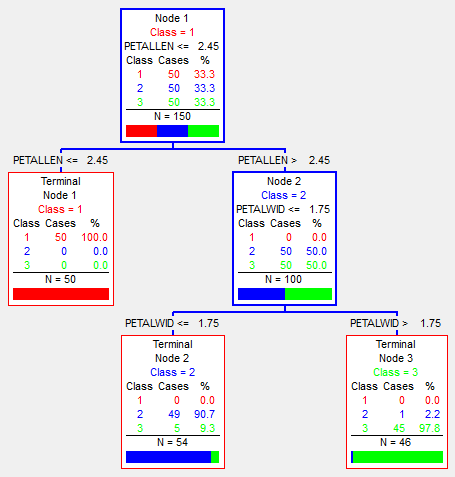 Classification and Regression Trees. Lectures from Statistics Department, Carnegie Mellon University, Cosma Shalizi. Video "Introduction to CART", Mikhail Golovnya, Salford Systems. Scikit-learn manual for decision trees. Data Mining Algorithms in R - Chapter "Classification with Decision Trees". Original book, which describes methodology: Classification And Regression Trees. Leo Breiman, Jerome Friedman, Charles Stone, Richard Olshen. This method of building predictive model is based on constructing a set of small regression decision trees, that are fitted (learned) sequentially, where each next iteration learns from error of previous iterations. Video "Introduction to TreeNet", Mikhail Golovnya, Salford Systems. Scikit-learn manual for Gradient Tree Boosting. Original paper, which describes methodology: Jerome Friedman. Stochastic Gradient Boosting. The idea behind Random Forests, is that you are building strong classifiers on independently sampled data subsets, while using random selection of features to split each node. The generalization error for forests like this converges to a limit as the number of trees in the forest becomes large. Video "Jeremy Howard discussing Random Forests". Video "Introduction to Random Forests", Dr. Adele Cutler. Scikit-learn manual for Random Forests and Randomized Trees. Original paper, which describes methodology: Leo Breiman, Random Forests. As a conclusion, I would say that all three methods have their own advantages and disadvantages and it's worth learning how and when to use each on of them.